Campaign for a Commercial-Free Childhood: "But Mama, just buy one at the store"
"But Mama, just buy one at the store"
The following post was written by guest blogger Brandy King. After spending the last eight years working with research on children and media, Brandy now faces the challenge of raising two young boys in a media-saturated and commercialized world. This is the first in a series of posts about attempting to maintain a commercial-free childhood for her sons. If you've faced similar challenges, we invite you to comment below about your struggles and successes. "Cameron, look! 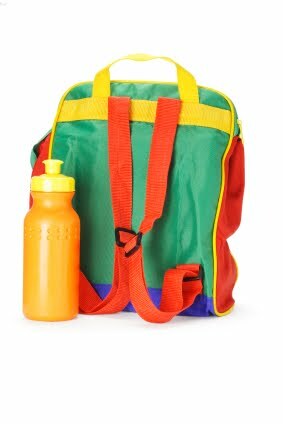 This is the backpack you're going to take to preschool!" I said with genuine excitement as I pointed to the catalog picture. The primary-colored backpack with the embroidered dumptruck was just perfect for my little guy. "No!" he yelled in that charming way two-year-olds have. "I want to take my Thomas backpack!" I was puzzled. "Cameron, you don't have a Thomas backpack..."
"But Mama, just buy one at the store." This was Cameron's first "consumer moment;" the first time he had asked me to purchase anything. I wasn't quite sure what to say, so I responded with the classic "We'll see" and surprisingly, he let it go. I never ordered that dumptruck backpack. And when his grandmother heard this story and immediately purchased a Thomas backpack for him, I kept it hidden in the basement. I needed time to think about this. I wanted to use this as an opportunity to set a precedent for how I would respond to this kind of request. How did he know it was an option to have Thomas on a backpack? When did he start to understand that I could purchase things? I needed to think back to why my immediate reaction was "No" and I needed to consider why I hadn't just responded that way in the first place. When Cameron was born, I was in my fifth year of work as a research librarian at The Center on Media and Child Health. After everything I had read about marketing to children, I had decided to make a conscious effort to limit his exposure to media in general and to licensed characters in particular. (Brand new research confirms my instinct: The more familiar kids are with commercial characters, the more they nag their parents for purchases). Cameron first learned about Thomas from a puzzle at someone's house. He had not watched the TV show and did not own any items with Thomas on them. I really have no idea what prompted him to proclaim his need for Thomas to be on his backpack that particular day, but my first thought was "Half the kids in his class will probably have a Thomas backpack" and I didn't want him to be one of them. So why hadn't I said no right there? I realize now that my line of thought was "I want him to be excited about preschool and if a Thomas backpack stirs up excitement, then maybe I should get him one." But after some serious thinking, I came to the conclusion that what I want him to be excited about is learning, playing, and meeting other kids. And those have nothing to do with Thomas. So I have spent the last two months psyching him up for all the new friends he'll make and for all the painting, building, and dress-up he'll be able to do. All the descriptions have worked; he is eager for the first day of school. And when he arrives, he'll be wearing an adorable backpack patterned with regular old run-of-the-mill trains, trucks and cars. Do you remember you child's first "consumer moment"? What did they ask for? How did you respond? Comment below! When my daughter was maybe 4 or 5 (she's 6 1/2 now), she went through a phase asking me whenever we would pass the Godlen Arches "WHEN can WE go to McDonalds?!?!?" I repeatedly answered "Never". Eventually she stopped asking. But I doubt the questions won't reappear again sometime. Ours was at Target. While I limit TV, she does watch some and from friends knows most common character names. We had seen children wearing character clothing and shoes in the past and she always asked where did they get that Dora Shirt or Princess shoes. Especially the Disney Princess Shoes, she had no idea who they were, she called them the shoes with pretty girls on them. We were at Target shopping and she saw an Olivia Shirt. She was jumping up and down in the store, clapping. Then she says "oh Mommy you did it, you found the store that has shirts with pictures on them." You would not believe the level of joy. Like we had found the Holy Grail. I blanked, froze. Had no idea how to handle it. I don't buy character toys, she has never had a character piece of clothing. So I lied. Told her it wasnt her size. Let her pick out a Olivia Book instead. And avoid target when I have her with me. It was a sad day but made me realize to be more aware. Good for you for not giving in. Before I had my daughter, and while she was still quite small and I was very adamant that I was not going to be one of those parents who was ruled by consumerism. Then my daughter entered the dreaded princess phase and it was just so darn cute, all of a sudden I found myself letting all sorts of things into the house. After her 3rd birthday party, where every single gift she received except one was Disney Princess, I had my wake called. Now I have to remind her, myself, and her grandparents who are the source of a lot of gifts, that there is more to the world then princesses, or Dora, or My Little Pony... Etc. I tell her it is okay to have a few items that are Princesses, but Superhero's are cool too. When my kids were preschoolers, they often asked us to buy fruit leather at the grocery store. While I was fine with buying fruit, those little plastic wrapped fruit leathers were not on my list. I always gave them permission to buy the fruit leather with their own allowance money. Rarely did they decide to part with their own money to buy fruit leather! For about 4years of her life, my daughter had never really asked me to purchase anything for her.She had come with me on my weekly grocery shop and I guess was used to seeing things in the store and not really asking for anything. Until, her father came with us a few times and bought her gum (or a treat) at the front check-out and it was shortly after that, she would start to ask for treats at the front counter. Now that she is in school, she points out everything that her friends get for treats, that we don't buy-so it is a constant! We don't spend much time at the mall so it's not so much the toys/clothes that she asks for, it's more the junky snacks and treats that she sees! I love this Brandy! And you are right, it's SO HARD to separate out why you might give in - what are the real reasons behind the wavering and what are the points that should be emphasized that are being overlooked? (like the impending fun at school versus the character on the bag). It's already hard for us to keep explaining to the grandparents and sometimes I get frustrated with what winds up at our house and either donate or consign items. Hang in there everyone. You're fighting for a worthy cause! I just witnessed our 2 year-old's first consumer/character awareness moments this summer. I'm very picky about what we let her watch on tv (not much) and what comes into the house (no licensed characters), so I was completely surprised when she started pointing out Elmo when we'd go to the store. I didn't even know she knew who he was! Then, when we went to buy her Big Girl underwear at Target the only options were Hello Kitty or Cars. She knew both. I can only guess that she's been exposed to all these consumer choices at school (childcare) and I find that to be a HUGE reality check for me. No matter what we choose to allow in the house, there's always going to be this wild card of school/friends/the outside world. It just makes my job that much harder...and I have to be that much more vigilant about talking to her WHY we make the choices we make at home. We don't do licensed characters, either. Our son is nearly five, and he goes to a preschool that doesn't allow branded toys. But he learned about Thomas via playdates. Thomas nagging (and some Hello Kitty nagging) started almost a year ago. We were lucky because we had already started a dialogue with him about marketers tricking children (and adults) for money, and "junky" toys made cheaply in factories that don't care about kids or their workers (this is over simplified, of course; complexity will get built in later). So when the nagging starts, we talk about marketing tricks and corporate ethics in this simplified way, and honestly it will often stop the nagging. At least temporarily. He seems to appreciate a reason for not getting the toy, and he seems interested in understanding the issues. It's a good opportunity to talk about these issues! Great post and discussion. It's wonderful to hear different perspectives and strategies. Now I find that the biggest struggles are around candy when we go to pharmacies. A few days ago she threw a tantrum over M&M's (the brand that swears it doesn't market to kids), presumably because she loves the characters on the package. The candy display was so low to the ground that I honestly had no idea it was there until the nagging started. It is spendy, but for those of you lucky enough, familiarize yourselves with your local Waldorf School if you have one near. It is a whole school and community that support this idea. I never knew Waldorf existed until I was nearly 30 and I am excited to try to send my children there one day. It will help me feel relieved to know my principals are understood and reinforced by my children's peers, teachers, and school. Even if I can't afford it full time I will try to participate in play groups, festivals, etc. with my local Waldorf community. I just had to share because I personally am very relived to have at least some people in my life who GET IT, and don't have to be explained to about why we don't have a TV or licensed characters, etc. in our home! I definitely recall the "Lunchables" peer pestering and pre-school peers "tube feeding" via (neon at the time)Trix GoGurt which was integral in my developing counter-marketing programs early on. A child asks for something that s/he sees in an ad, and the parent gives it to them when the parent does not want to give it to them. Is that a media problem or a parental problem? I only buy wheat I want my children to have. I am OK with Spongebob so I buy Spongebob items. If you do not like it then say no. Why should we do without because you don't have the nerve to say no? Grow up and take responsibility and stop expecting others to make decisions for you. When my daughter was 4, she and her pre-school friends used to play Mary, Kate & Ashley. They had no idea who the Olsen twins were, but somehow knew their names but not that they were only 2 girls. "If you do not like it then say no. Why should we do without..."
Who's suggesting you should do without? The idea is that marketing TOWARDS CHILDREN has gotten too aggressive, not that the items shouldn't exist at all. However, that isn't even what this article is about. In fact, I think the author is telling a story where she did exactly what you are proposing. She thought about her reaction, clarified her reasoning, came to a conclusion, then said no to her son. This is exactly the model your comment encourages - take responsibility for your choices as a parent. I could go over all the problems with excessive marketing towards children, but I'm sure as a mature parent you are willing, able and ready to take responsibility and not expect others to do your research for you. My girls are 2, 4 & 6 and the older two are in the throes of the Princess fever (although our biggest area for whining/begging is definitely food). Like another commenter, we have had many discussions about marketing, about how companies have to make you feel like you want something, and about choosing quality products. When I see a particularly clever ad, I point it out to them and we talk about it. When they ask for something, I ask them why they want it. Often I am able to show them how their desire has been created by advertising. Overall, I want to keep the lines of communication open with my girlies. I want to help them think through their choices rather than just acting on a feeling. I don't want to just say "no," because I won't always be available or able to make their choices for them. I want them to recognize when they are being manipulated and be able to make a thoughtful decision (even if that choice is sometimes to buy a product).